Marijuana prohibition has not been effective in its stated goal of stopping or curbing marijuana use across New York State. Instead, prohibition has fueled the growth of an illicit industry, has been disproportionately enforced in communities of color, and has been fiscally irresponsible. 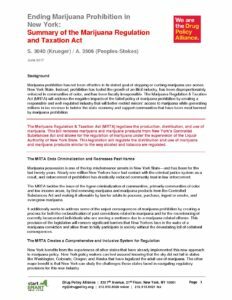 The Marijuana Regulation & Taxation Act (MRTA) will address the negative impacts of the failed policy of marijuana prohibition by creating a responsible and well-regulated industry that will better restrict minors’ access to marijuana while generating millions in tax revenue to bolster the state economy and support communities that have been most harmed by marijuana prohibition. The Marijuana Regulation & Taxation Act (MRTA) legalizes the production, distribution, and use of marijuana. This bill removes marijuana and marijuana products from New York’s Controlled Substances Act and allows for the regulation of marijuana under the supervision of the Liquor Authority of New York State. This legislation will regulate the distribution and use of marijuana and marijuana products similar to the way alcohol and tobacco are regulated.